I love a self contained food dish. Nothing makes me happier than a crock pot meal or a one skillet dish that requires minimal prep. One of our family favorites is the Chicken Skillet Bake. It’s a great any time of the year, super easy to prepare, and contains fat, protein and carbs (veggie) in one dish. 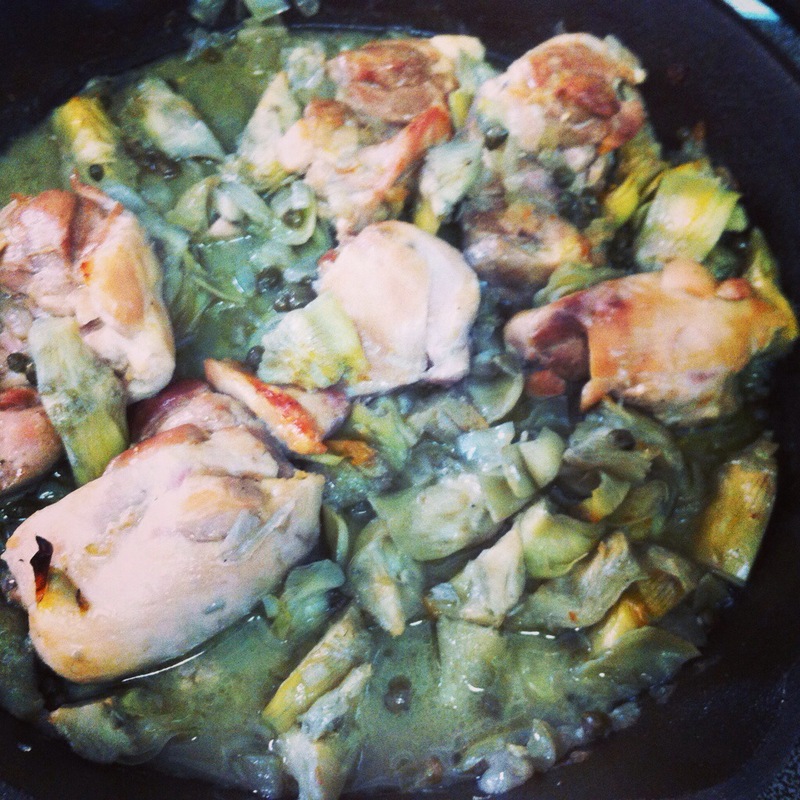 My husband loves it, and I make it with chicken thighs (his favorite!). The inspiration for this recipe comes from one of my favorite cooking books – Practical Paleo. I like to use a cast iron skillet. It gives the chicken a great flavor, and it’s just an overall great piece of cookware to own. If you don’t have cast iron, you can use a regular, oven-safe skillet (nothing anodized). In your oven-safe skillet, heat 2 tablespoons of butter or oil over medium heat, add onions and cook until translucent, stirring frequently. Stir in the artichoke hearts, capers and lemon juice. Place the chicken pieces in the skillet, and top them with the remaining 2 tablespoons of butter or olive oil. Here comes my favorite part – place the entire skillet in the oven, and cook for 45 minutes or until the chicken has an internal temperature of 165 degrees. While your dinner is baking, take some time to spend with your kids, catch up on clothes, read a book, surf the internet, or just relax! Until next time, happy and healthy living to you! Don’t forget to visit my Plexus Slim page at http://www.plexusslim.com/jadabruce for detox products, probiotics, weight loss, vitamins, pain management and breast health or you can email me at JadaDanos@gmail.com.